Smeg continues to expand its retro-themed kitchen tech range with the release of the KLF04 Kettle and HBF02 Hand Blender. With a choice of temperatures from 50 degrees to 96 degrees - and a soft opening lid and a handy 360 degree swivel base with non-slip feet - the KLF04 is a steal at £149.95. It'll be available later this month. Then there's the HBF02, which uses a unique Flow Blender system to ensure you get a smooth and even consistency whether you are making soups, dips, purees and desserts. 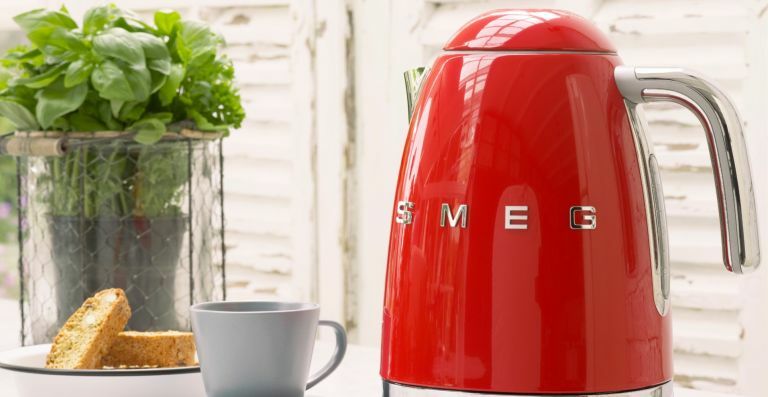 Smeg has packed the HBF02 with a diverse range of no-fuss, attachable accessories to cater for a wide range of cooking habits. Buy one in red, black, blue and cream for only £119.95 when it becomes available later in September. Netatmo hcas confirmed the UK availability of its clever new Smart Radiator Valves. Netatmo Smart Valves enable you to control your heating on a room-by-room basis and use on average 37% less energy to heat your home without compromising on comfort. The gizmo - which works with both Apple Homekit and Google Home - can detect the ambient temperature around it, including when a window has been opened in a given room. Netatmo Smart Radiator Valves are available from today. They will retail for £69.99 each and can be found at John Lewis, Cefco, Maplin, ShopUK, Amazon.co.uk and Netatmo.com, as well as retailers for professionals such as Plumb Center, CEF and Graham. Visitors to IFA 2017 in Berlin were able to test out the new 4K VR 360 camera from Kodak Pixpro, but you won't have to wait any longer to get your hands on one as it's now available to buy worldwide. A compact, ultra-portable camera, the 4KVR360 has been designed to capture every detail in interactive images and videos, featuring a full 360 degree shot, and three unique multi-view angles. The powerful little VR cam gives you the flexibility to frame, capture and shoot in any way you choose. Kodak Pixpro’s 4KVR360 camera is available now in the UK via Currys, priced at £419.99. Debuted at IFA 2017, the new Creative Omni is a wireless Bluetooth speaker that enables you to control your audio remotely or link multiple speakers together for one big networked party. You can use multiple Creative Omni units all around your abode and enjoy music wirelessly via Wi-Fi. The speaker works with the Sound Blaster InterConnect app that enables you to manage audio streaming to one or multiple speakers from your smartphone or tablet. Creative Omni will be available at Creative.com end-October 2017 and priced at £109.99.